I may discuss full theoretical concept of BLOB in some other post but about scope of this post, I have already mentioned. 3. Select CLOUD project from Cloud tab. 3. For local development fabric selects first option. To add Container name, essentially you need to add one more setting. 1. Must start with a number or letter or dash. 3. Must be minimum 3 in length and maximum 63 characters in length. I am going to create a Utility class. This class will contain all the basic functions related to BLOB storage. Right click on WebRole project and add a class. I am giving name of the class BLOBUtility. 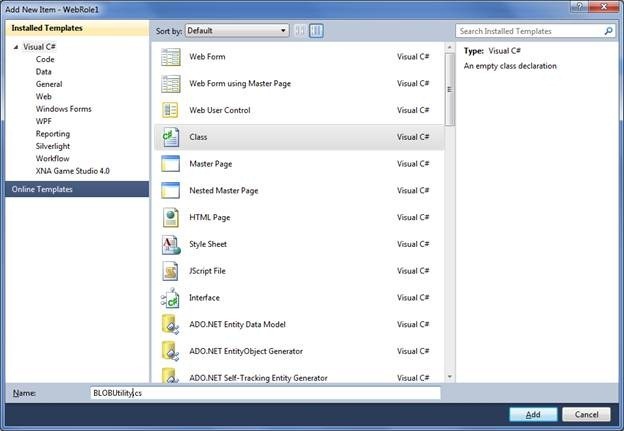 Make sure you have added the below namespaces and put the class a static. 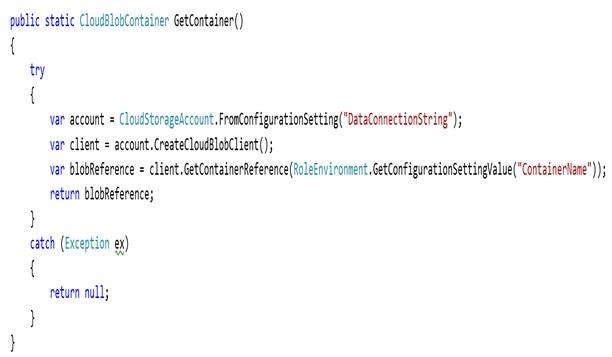 In BLOBUtility static class write a static function called GetContainer(). 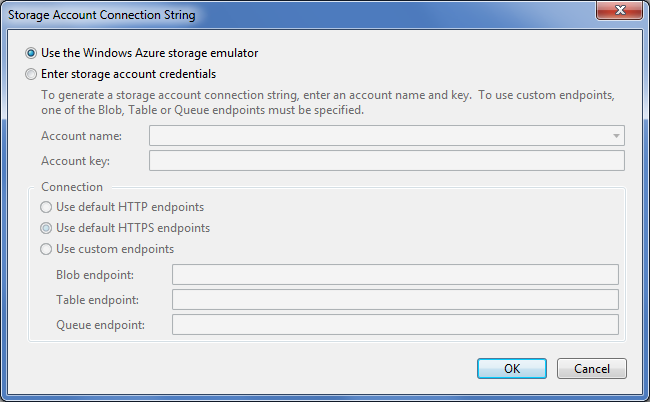 This function will return CloudBLOBContainer . First I am getting storage account. Make sure that you are passing correct Connection String Name. 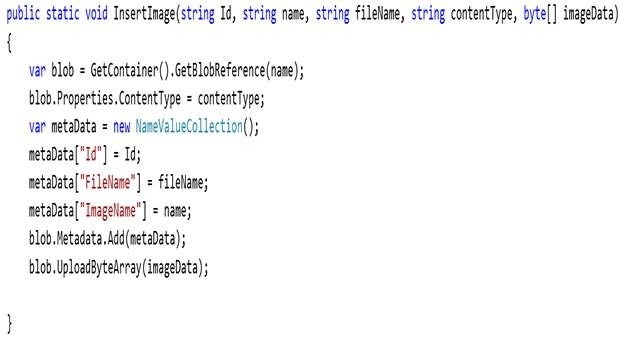 If you would have noticed, I created a connection string of name “DataConnectionString “in previous steps. So as input, I am passing DataConnectionString. Second task I am doing is creating a BLOB Client. 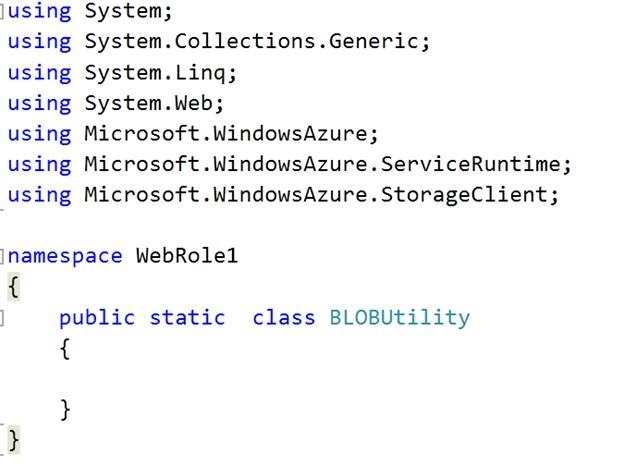 In BLOBUtility static class write a static function called EnsureContainer(). This function will not return anything. First I am getting the Container and if container does not exist, creating it. I am setting the Public Access permission to Container. In above function, you need to pass metadata associated with the file as input parameter. A very important point worth noting here is that make sure you are passing an ID for sure as input parameter. At time of calling pass unique GUID as ID. Essentially there are three parts in above function. 1. 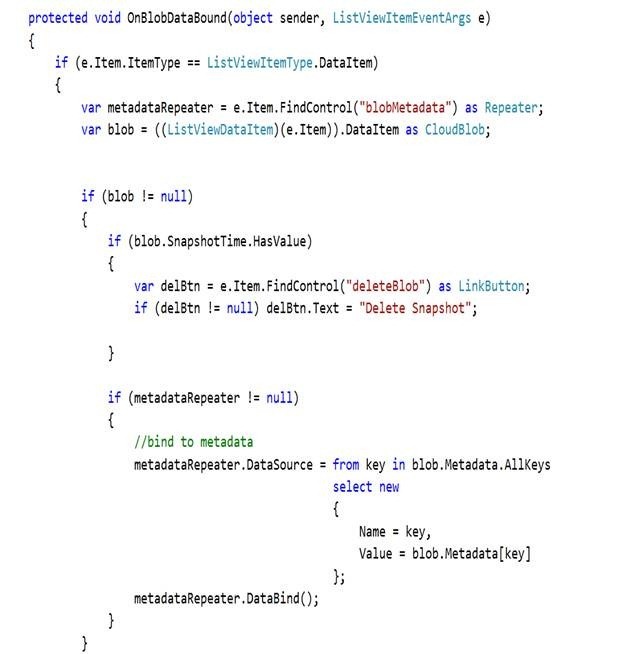 Creating Metadata from input parameters. 3. Uploading Byte Array to the BLOB. In above function as input parameter pass URI of image to delete. Using image URI get the BLOB reference and delete image file. Once DeleteImage function is ready your BLOB Utility class is ready to use. <asp:Button ID="btnUpload" runat="server" Text="Upload Image" Width="209px"
In above function I am setting as Data Source of repeater control Meta data values from the BLOB. Press F5 to run application on local development fabric interacting with BLOB storage. I’m unable to upload more than two images into it. Could you please say me the reason? Just wondering how one would go about sorting the list by date uploaded. As I upload more and more image I would love to have the most recent upload at the top.